A team of chemical engineers led by Paul J. Dauenhauer of the University of Massachusetts Amherst has discovered a new, high-yield method of producing the key ingredient used to make plastic bottles from biomass. The process is inexpensive and currently creates the chemical p-xylene with an efficient yield of 75-percent, using most of the biomass feedstock, Dauenhauer says. Dauenhauer, an assistant professor of chemical engineering at UMass Amherst, says the new discovery shows that there is an efficient, renewable way to produce a chemical that has immediate and recognizable use for consumers. He says the plastics industry currently produces p-xylene from petroleum and that the new renewable process creates exactly the same chemical from biomass. ‘You can mix our renewable chemical with the petroleum-based material and the consumer would not be able to tell the difference,” Dauenhauer says. Consumers will already know the plastics made from this new process by the triangular recycling label “#1” on plastic containers. Xylene chemicals are used to produce a plastic called PET (or polyethylene terephthalate), which is currently used in many products including soda bottles, food packaging, synthetic fibers for clothing and even automotive parts. 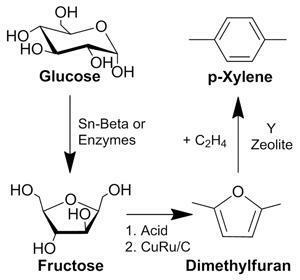 The new process uses a zeolite catalyst capable of transforming glucose into p-xylene in a three-step reaction within a high-temperature biomass reactor. Dauenhauer says this is a major breakthrough since other methods of producing renewable p-xylene are either expensive (e.g., fermentation) or are inefficient due to low yields. A key to the success of this new process is the use of a catalyst that is specifically designed to promote the p-xylene reaction over other less desirable reactions. Dauenhauer says his research colleagues, professors Wei Fan of UMass Amherst and Raul Lobo of the University of Delaware, designed the catalyst. After a series of modifications, the team was able to help enhance the yield of the reaction. He also says additional modification of the process can further boost p-xylene yield and make the process more economically attractive. “We discovered that the performance of the biomass reaction was strongly affected by the nanostructure of the catalyst, which we were able to optimize and achieve 75-percent yield,” Fan says. Computations conducted by the team have been instrumental in understanding the reaction mechanism and the role of the catalyst as well as making alteration to the catalyst to improve the yield of the process. Besides Dauenhauer and Fan, the research team is made up of UMass Amherst’s C. Luke Williams and Chun-Chih Chang, doctoral students in chemical engineering, and their collaborators, professors Raul F. Lobo, Dionisios G. Vlachos and Stavros Caratzoulas, as well as doctoral student Nima Nikbin, and postdoctoral fellow Phuong Do from the University of Delaware. This discovery is a part of a larger effort by the Catalysis Center for Energy Innovation (CCEI) to create breakthrough technologies for the production of biofuels and chemicals from lignocellulosic biomass. The center is funded by the U.S. Department of Energy as part of the Energy Frontiers Research Center (EFRC) program which combines more than 20 faculty members with complimentary research skills to collaborate on solving the world’s most pressing energy challenges. The discovery for the production of plastics adds another dimension to the portfolio of accomplishments of CCEI. In 2010, a CCEI research team led by Mark Davis of Caltech discovered a new catalyst, called Tin-Beta, which can convert glucose into fructose. This is the first step in the production of a large number of targeted products including biofuels and biochemicals, including p-xylene, from the building block of cellulose, the major constituent of trees and switchgrass. In addition, a team led by Ray Gorte and John Vohs at the University of Pennsylvania has developed a novel fuel cells technology that converts solid biomass to electricity and another led by George Huber and Wei Fan of UMass Amherst has improved the yield to aromatics that can be used as drop-in fuels to gasoline.